The state ferry Margaret Chase Smith prepares to disembark passengers and vehicles at Islesboro recently. A new fare structure from the Maine Department of Transportation is being challenged by Islesboro residents, who have been informed that their tickets to the mainland will more than double on May 21. Some disgruntled islanders allegedly responded with threats of retaliation against DOT workers assigned to the state ferry service. That has prompted DOT Commissioner David Bernhardt to make some threats of his own. Every day, a ferry boat known as the Margaret Chase Smith makes nine 15-minute trips between Islesboro and Lincolnville on the mainland. On a recent day, the seas were calm, even if the attitudes among some of the motorists waiting to board the ferry were not. Things have been tense ever since Bernhardt threatened to suspend ferry service after islanders allegedly posted threats over the proposed fare increase. Marilyn Pendleton, 87, makes regular trips for appointments and other errands. She says she expected a fare increase. “I figured it [the rates] would go up, but not that much,” she says. 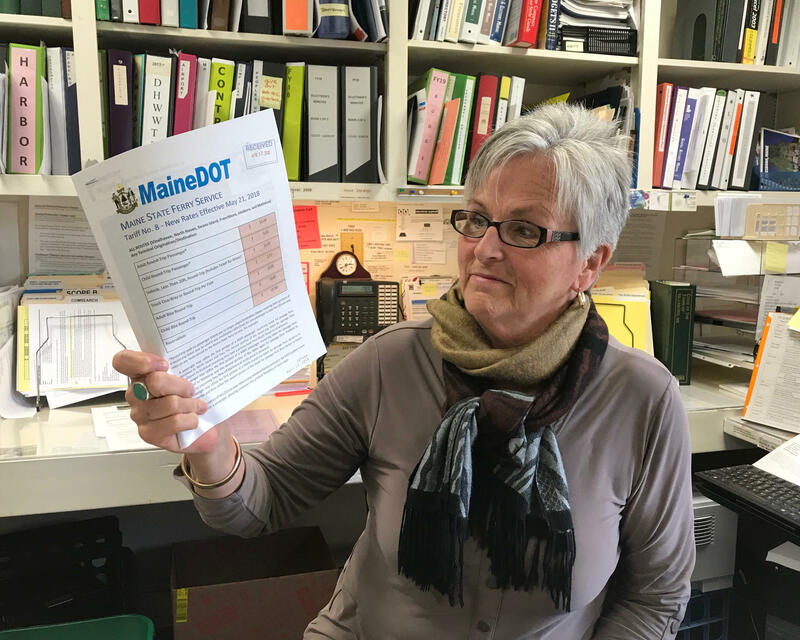 Islesboro Town Manager Janet Anderson holds a notice from the Maine Department of Transportation detailing proposed new fares. Anderson says the town plans to appeal those increases. Fares have not increased for nearly 10 years, and state transportation officials say operating costs have outpaced the original pricing formula that gave island residents a discount. This year the DOT has attempted to standardize fare rates throughout the ferry system. Travelers like Pendleton will see the cost of their regular trips go up from just over $13 to $30. For two people and a vehicle, the fare jumps even higher — from about $19 to more than $40. “It’s going to be detrimental to the young families on the island who have children that want to go to the mainland more often than some of us older people, but even for my husband and I,” says Sharon Ashley, an islander for 36 years. Ashley says the fare increases mean that life will change for many of the island’s residents, and not for the better. “We have a small business and it could essentially put us out of business, because we have a lot of workers who come from the mainland, and they’re not going to be be able to afford to come unless we pass the costs on to clients, which isn’t likely to happen,” she says. Some residents became so enraged after learning of the fare increases last month that they took to social media to express themselves. Others chose to vent their frustrations at some of the DOT’s ferry workers. Bernhardt says one even went so far as to suggest firebombing the ferry service on the Islesboro Facebook page. Another told a DOT worker that it might be a good idea to wear a bulletproof vest. Bernhardt let Isleboro town manager Janet Anderson know that any additional similar behavior would leave the town without ferry service. “They said things in jest,” Anderson says. “I never got excited about it, thinking that someone’s going to firebomb the ferry, well that doesn’t make a lot of sense, or telling the crew that they might want to wear a flak jacket. I mean it’s the same kind of thing that they might kid me about if something crazy had happened,” Anderson says. 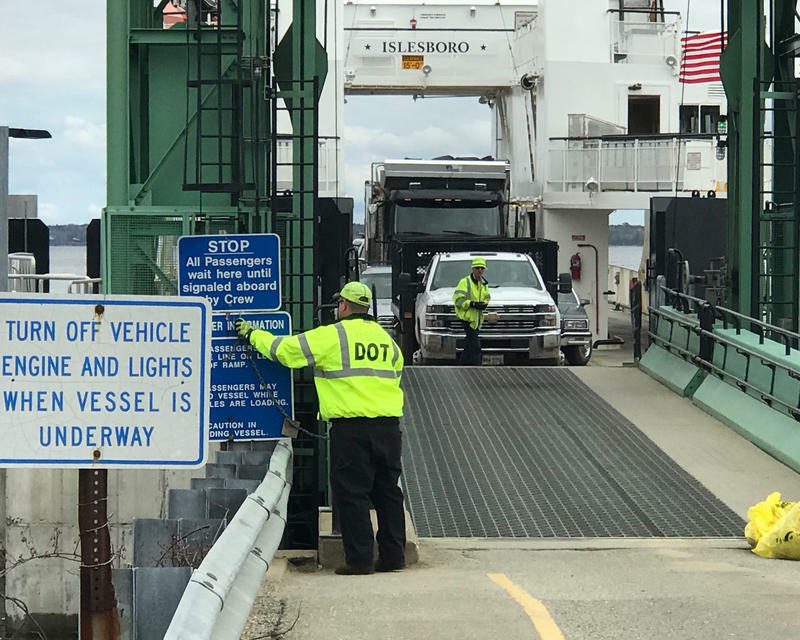 “At the Maine State Ferry Service, the safety of our employees and the public is of paramount importance in the operation of the Maine State Ferry Service — any threats of violence, we have to deal with accordingly,” says Mark Higgins, manager of the Maine State Ferry Service. Higgins says the commissioner’s response has defused the situation and tensions have eased. He also defends the ferry rate as needed, given the $11 million shortfall in the ferry service’s budget. The new rates are scheduled to take effect May 21. Anderson says her community has retained legal counsel and plans to appeal the increases.